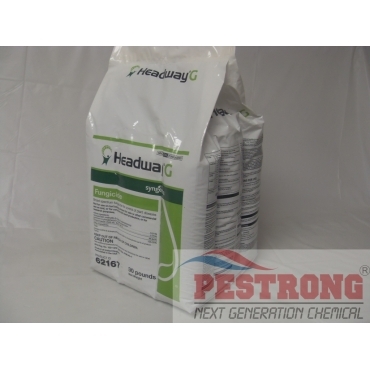 Where to Buy Headway G Fungicide, Headway G Broad Spectrum Fungicide - 30 Lbs - $82.95 for Sale with Fast Free Shipping! Headway G Broad Spectrum Fungicide - 30 Lbs provides the same long-lasting broad-spectrum control of the liquid Headway formulation on turfgrass diseases including brown patch, dollar spot, anthracnose and take-all patch. Dominion 2L Termiticide - 27.5 Oz - 2.15.. It provides the effectiveness of a spray with the convenience of a granular due to a highly soluble carrier. Headway G works in areas Headway cannot due to weather conditions preventing a spray application. Broad-spectrum control up to 28 days. Will typically disperse with a heavy dew or light watering (approximately 2–3 sprinkler revolutions). Engineered particle minimizes dust formation. The Headway G carrier provides for root uptake and also leaf intake. Because the carrier dissolves so easily and quickly, it does not stick to the leaf, is not picked up with clippings, and does not leave residue on shoes. Stops the infection and prevents it from spreading. Application rates and intervals of Headway G vary depending on target diseases. Headway G worked like a charm on the brown patches last year. Looking forward to using it again this year. Great quality product for lawn fungus. Used this out back for red thread & the lawn continues to improve. Just need it to stop raining!! Headway G is away to apply in the granular form. I am battling pythium blight on my lawn and my lawn looked terrible after the snow finally melted from winter. Headway cleared up and greened up my lawn in a couple weeks after applying along with a fertilizer and crabgrass preventer. I have a few small trouble areas that need to be treated again so I am buying another bag but Headway seems to be limiting an controlling most spots as the blight was much worse last year. Good quality product easy to apply and effective. I am battling pythium blight on my lawn and this product has been effective for the majority of the lawn. There are a few problem spots that are pesky and need another treatment but all in all this is a solid product and reasonably priced as far as fungicides go. This is an easy way to place fungicide in your yard, although I'm not convinced that granules are as effective as spraying, especially if spot control is the goal. The cost per 1000 SF is reasonable. Using this product as part of a fungicide rotation is the preferred method. The best way to prevent and control brown patch or large patch in the home lawn is by using headway fungicide. This is much easier and less expensive than other fungicides and can be very effective. Excellent fungicide with two combine fungicides for all of variety case.